We provide paid experiential learning opportunities for UNCW students and other qualified candidates who are passionate about sharing their knowledge, skills and enthusiasm with the youth participating in our programs. Our staff serve as mentors and role models to children and teens who have chosen to attend UNCW youth programs because of their quality reputation. 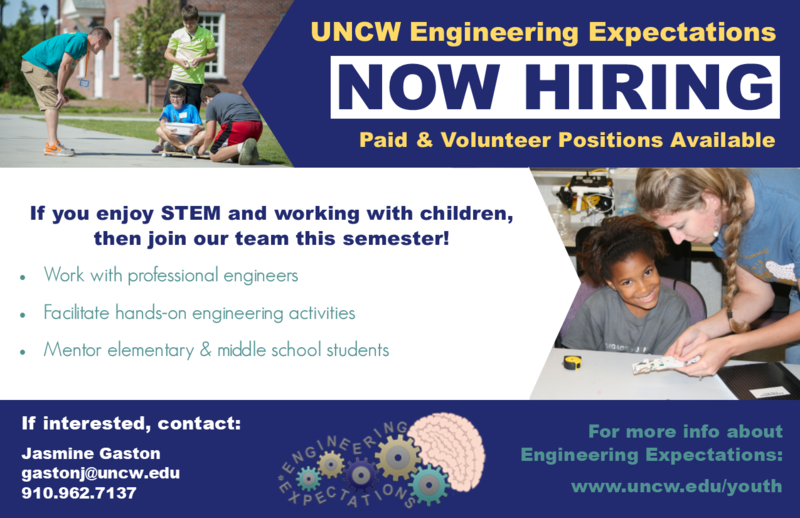 If you enjoy STEM and working with children, then join our team this semester! Please review the Weekend Programs offered and click on the employment opportunity below for more information. If you have a background in engineering and are interested in working with youth, please review the camps offered on the Engineering Expectations Page and then follow the instructions below. Please click on each employment opportunity category below to see a full description of available positions. Each program has specific needs corresponding to the ages of the students and the content of the program. Please look over these job descriptions and identify which age/program/position best compliments your experience. Need summer housing? Staff members interested in on-campus summer housing may contact Jasmine Gaston for more details.